Searching for reliable skip hire in East Ham that won’t break the bank? Away With It are a local firm you can trust. Not only have we been keep people’s properties free of waste for years, we are fully licensed and insured specialists, which lets you know you will be in the best hands. Our enviable reputation has seen customers come to us countless time and recommend us to our friends. Whether it’s our green approach to waste removal (recycling 80% of all waste) or unparalleled customer service, we know our skip hire services won’t be matched. 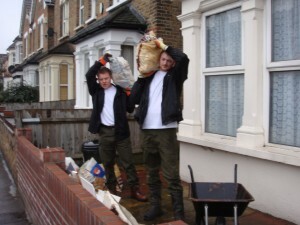 Why Choose Away With It for East Ham Skip Hire? 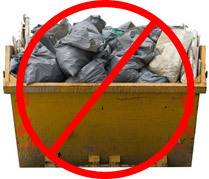 We know what people want when they look for a skip hire company; reliability and low cost. After years of working in the area we have tailored our services to give property owners, both residential and commercial, exactly what they want. Everything is planned 100% around the client, making sure to abide by any special requests. Whether it’s a same day service, one item or 100, we will always get the job done with a smile on our faces! As East Ham’s most reputable skip hire firms, flexibility is one of our buzzwords. We don’t agree with waiting around for a skip, it certainly doesn’t help you. This is why we offer a same day service. Alternatively, you can pick a date and a time that suits you. To make your lives easier we are open seven days a week between 7am and 11:30pm meaning there is no restriction on time. If you want a pre or post-work slot, all you have to do is ask. Call today to get the ball rolling! Many people are often put off from hiring a skip, wincing at the quotes they have been given in the past. However, there is no need to be reluctant with us. Most customers are very pleasantly surprised when they receive their no-obligation quote from us. Luckily, we do offer another skip hire solution that may suit you even better…. We’re a dedicated waste removal firm, happily providing skip hire in the East Ham area for years. However, that’s not all that we offer. Alongside our standard skip hire service, we can also provide two-man waste removal teams. With this service you’ll benefit from having our team of experts carry all your waste out to our van, meaning no heavy lifting for you. In addition, with our van-based service you pay only for the specific volume of waste that we remove – not for the whole skip. In many cases our two-man teams can be cheaper and more practical for you. However, it is completely up to you. Always feel free to call Away With It to find out which is the best option for you. Get Your Free Quote for Skip Hire in East Ham! Our team is ready and raring to help you with skip hire services in East Ham. Getting rid of that cumbersome old kitchen or pain in the neck garage waste has never been easier. So, what happens next? If it’s a couple of items, give us a ring and we will provide a free no-obligation quote over the phone. If the job is larger, we may send one of our team out to your property, this is to ensure we advise the best solution for you. In many cases, if you give us the nod, we can even take your waste away at the same time. With visits available at short notice, it’s never been easier or cheaper to hire a skip or get rid of unwanted waste. Call us morning, noon, or night on 0208 504 7390 to secure your skip hire service. Don’t waste another day stressing over unwanted waste.